Hia my lovelies! Sorry for the hiatus. Been resting over the last couple of months to recover from a pinched nerve at the back of my neck. Almost better now and glad to be out and about. We all seek eternal youth! Maintaining the right fitness to wellness reflects a youthful and glowing skin. I have always been very watchful of what goes into my body and what I apply on my skin. Turning 40 this year was a breeze. I am no skin expert yet. Since I was 15, I have remained discipled. I focus on eat right, eat on time and remember to keep my skin clean and allow it to breathe. (less makeup, moisturiser and all that jazz if you know what I mean). I’m not a big fan of facials but I love a good massage now and again. I very rarely book appointments to have anything done. I am skeptical about the hygiene and products used. Lucky for me I have little to no hair growth on my face or body, so even getting the eyebrows or hair removal is ruled out. This week I wanted to share a beauty review with you. This is from one of the top leading brands in skin care called Decleor. They have been around for over 40 years. And are the leading innovators in aromatherapy skincare. When I received an invite to try out Decleor Facial. I didn’t even bat an eyelid and agreed to try it. The natural ingredients and animal cruelty free products have stood the test of time. I have heard only good reviews and wanted to see for my self. My appointment was at Mirrors & Within, located in UB City, Bangalore. The sparkling signage outside lures you to sneak a peak through the glass doors. Two floors with state-of-the-art furnishing and equipment make it a ultra luxury and chic Salon and Spa. To add, the hair and beauty experts make it one of the most preferred destination to get pampered. Beauty expert Lakshmi, is no newbie. She has been in the industry for about 25 years and worked her way with Decleor products. A glance at my face, she was able to diagnose and suggest the treatment to improve my skin texture and give it some TLC it deserved. To start, we begin with a basic breathing exercise. She placed her hand doused with natural oils along my nose. As I inhaled the fragrance it was refreshing. I exhaled and felt a sense of calmness already. We did it three times. Face Cleanse to remove the makeup and prep it for the 60 minute procedure. A face massage like no other! Decleor Rituals use the science of aromatherapy, the art of touch and the power of Aromachology (scents that balance emotions). No equipments or steamers of sorts. It is pure natural and organic oils, made from seeds of various flowers and hand techniques. Face Pilates if you will! A back, neck and hand massage, to relax the mind and destress. Exfoliation, followed by a nourishing mask, and allowed to sit for about 20mins. The fragrance, was so enchanting. I was completely relaxed. The pain in the neck and arms had vanished. The ritual uses Aromessence Neroli serum which is a Decleor masterpiece. This unique blend of essential oils is 100% natural, a drop, contains 150 molecules. The serum used made with botanical goodness, left me with an inevitable glow. Did you Know? The essential oils come from about 400 variety of plants out of the 386,000 found on earth to give instant result. Decleor have perfected the art and science for beautiful skin. I am not wearing any makeup except my favorite lipstick as I had to step out! My skin has a glow, the pigmentation vanished and my skin had no tan or uneven discolouration as before. It was soft and supple and felt fresh. Even the dark circles were lighter. 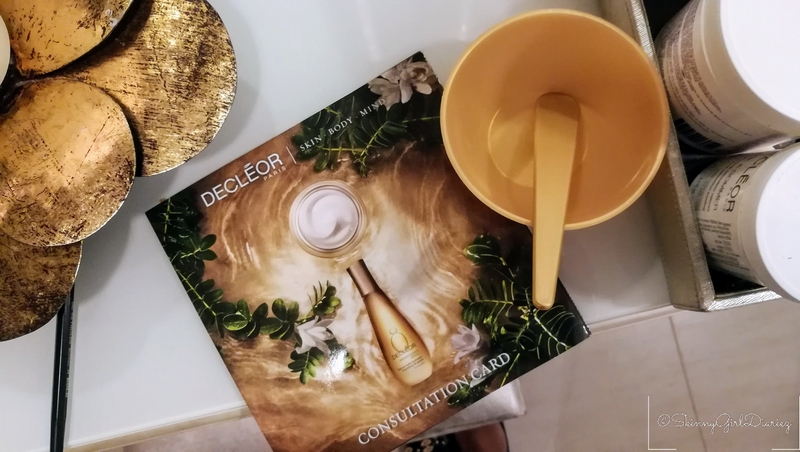 Decleor Philosophy comes true with a first hand experience for me. I had my Skin, Body and Mind come alive. And this glow remained for over a week. I kid you not. I am now looking forward to another facial or trying out the Decleor products to test it out. Looks like am a new fan of Decleor and seems like its a Cult following! Each treatment is designed to visibly improve the skin’s radiance while at the same time creating a unique sensory experience. This explains why DECLÉOR is a brand trusted by the best beauty professionals. Their expert hands stimulate the senses and care for the skin using natural and exclusively manual techniques. Have you used Decleor products or had an experience with their facials, do let me know via your comments below. Would love to hear from you. Mirrors & Within has been the quintessential beauty destination for Bangaloreans since its inception in 2002. With premium salons located at The Leela Galleria & UB City, Mirrors & Within is the ultimate destination for the highest quality in hair care & salon services. I feel in love with the ambience and services. Look forward to my next visit here, I want to try out hair cut and style and keep you posted on the review. Have you visited M&W or had an experience with their services, do let me know via your comments below. Would love to hear from you. **Disclaimer: Even though the invite was complimentary, all views expressed are my own. ← Mother’s Day Without A Mother – Don’t Judge Me For Hating This Day!